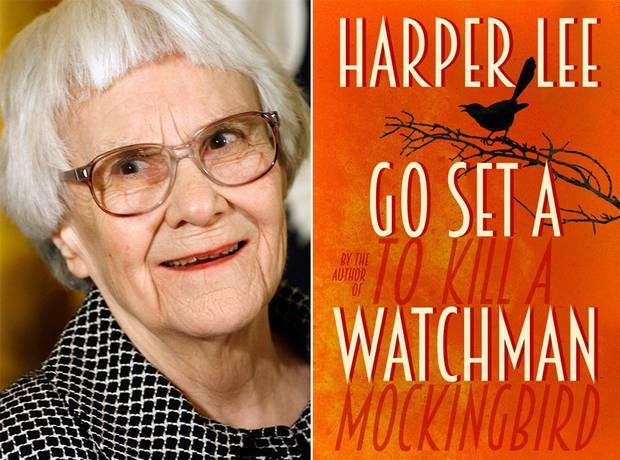 If Harper Lee wanted to destroy everything good she did in To Kill a Mockingbird, I’d say Go Set a Watchman was a massive success. But I’m afraid it may be an even greater tragedy than an author self-destructing. I wish I could un-read this novel, and it’s not because it was a terrible sequel, it’s because it caused me to doubt every character that was great in one of the best novels of all time. Had Go Set a Watchman been a genuine sequel I could have dismissed it, but it allegedly wasn’t. Apparently it was Harper Lee’s first novel. After being rejected by publishers, Lee went away to write the prequel, To Kill a Mockingbird. In doing so she created one of the most heroic, moral characters ever written. Go Set a Watchman gives us an insight into the ‘original’ Atticus, and he turns out to be a disappointing shadow of the man we thought we knew. Reading through Scout’s eyes, once again, we find ourselves wondering whether, like her, we had seen Atticus incorrectly all along. There is only one way in which Lee is redeemed in my eyes and therein lies an even greater tragedy. She never wanted this book published. Harper Lee, the unassuming, silent, reclusive, now elderly author, has possibly been manipulated and betrayed by money-hungry publishers. There are two things that I find almost impossible to resist at the shops: Shoes and books. I’ve had to be stern with myself about the shoe thing. I’ve learnt (I think) to stop buying shoes that are so uncomfortable that I can’t walk in them (even if they are, oh-so-pretty) and I’ve learnt that there are only so many pairs of shoes that you can wear in one year. Suffice to say, I have a large book collection and recently I had to pause and take stock. How many books have I bought on a passionate whim and never read? As I counted them up, I realized there are quite a few. Many of them, still on my ‘to be read’ list are pictured above. So I’m going to try to stop buying for a while, until I’ve actually read what I have! 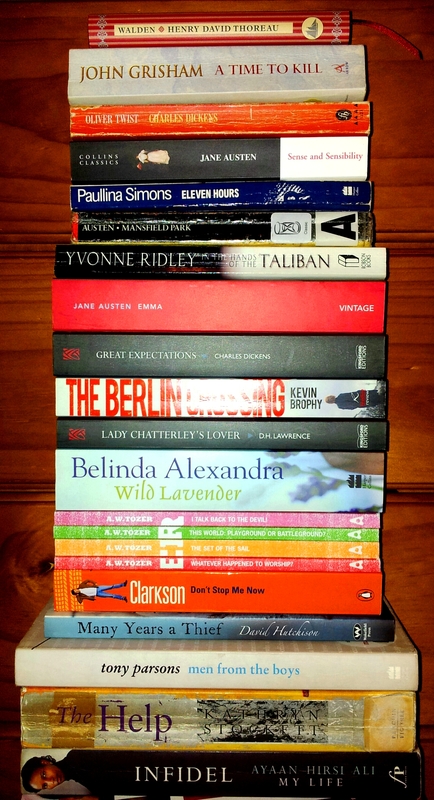 Do you have a stack of books that you ‘just had to have’ at the time, but that you haven’t read yet? What are they? I think I like Kristin Billerbeck – but I’m not sure. She’s one of those authors I find difficult to pigeon hole. This is the 4th book of hers that I’ve read. I really enjoyed What a Girl Wants. I found it refreshingly down to earth and honest, and I’ve re-read it a couple of times. I then bought the two sequels to it, and they didn’t impress me so much. What I love about Billerbeck is that she writes about real-life issues in a down to earth, honest and often humorous way. What I find difficult, is that she manages to combine that with something superficial and cliché, almost reminiscent of a television drama. These things are somewhat paradoxical, which is why I find her hard to pin down. 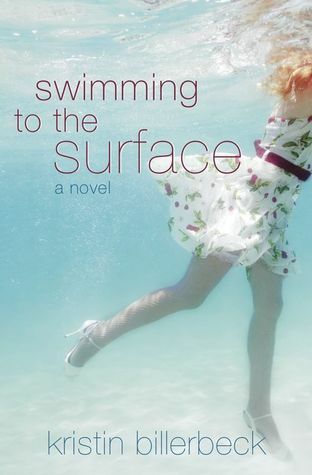 This novel, Swimming to the Surface, deals with a real and somewhat confronting issue: A woman who has become disillusioned with the Church because of the way in which they dealt with her in the breakdown of her marriage to her legalistic, mentally unstable, and, as it turns out, homosexual husband. These are heavy topics that do make for a fascinating story. But, somehow, Billerbeck still manages to give the plot a sense of story-book perfection, with many scenes that, to me, seemed unrealistic and cliché. From what I’ve seen, this book has had quite good reviews, but to be honest, I’m not a fan. Oh, and it’s the first book I read as an e-book. Probably didn’t help!